I am currently studying the Pen Down and the Pen Up blocks. The Pen Down block is a very simple block that is vital to get the sprite in motion. The Pen Up block is used to stop the sprite from moving, but the Pen Down block must be used with this block in order to make it function. Also, these blocks are used when art is required to be drawn. In TurtleStitch, Pen Down starts the sewing and Pen Up stops it. 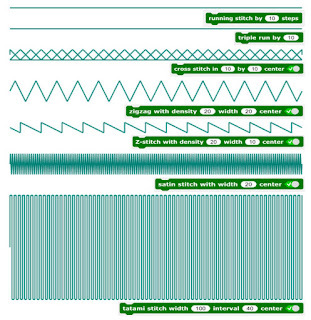 From an email received from Andrea, creator of TurtleStitch, she explained that the pen function is used as a metaphor for sewing. "It helps to understand jump stitches. It helps to understand jump stitches. You could also define a pattern by not using the pen function at all. If you use it in the right way it helps you to create securing stitches (lock stitches, in German: Vernaehstiche) at the beginning of the end of the parts of the pattern." Andrea was even kind enough to show us an example with explanations on how to use the blocks in her program. Michael clarified, in a recent email, that the Pen Down block is used if you want the moving turtle to leave a line, while the Pen Up block is used if you want to move the turtle without drawing. These blocks derive from turtle graphics and can be used in embroidery. The Pen Down and Pen Up have the same function as it does with turtle graphics, but Pen Up is intended to leave stitches that would later be cut up (jump stitches), while Pen Down is used to create stitches that are drawn on the fabric.